Mariners Latest: The KING Takes Control! Felix Hernandez started out a bit rocky today. His command was off and he struggled with his breaking ball and his fastball. Through the first two innings he had walked two batters and hit two batters. Through the following 6 innings he allowed just two hits and just one run. The only run scored on a wild pitch that Olivo couldn't handle and then couldn't find. It was a swinging strike three on John Buck that allowed him to take off after missing the pitch and allowed Hanley Ramirez to score from third. The kind of play that you probably will only see once in a lifetime and seems to be the kind of luck the Mariners have had lately. It was another ghastly performance from the offense through the first 6 innings as the only hit came off the bat of Felix Hernandez in the top of the third. It was the 7th inning that the offense finally came through against Ricky Nolasco. Brendan Ryan led off the inning with a walk. He was followed by Adam Kennedy who hit a soft grounder up the middle that just evaded the diving Omar Infante and allowed Brendan Ryan to hustle into third base. Smoak grounded out getting Brendan Ryan caught in a rundown between third and home but stayed in it long enough to allow Kennedy to get to third and Smoak to get to second. With runners at second and third the Marlins decided to intentionally walk Dustin Ackley to load the bases. Miguel Olivo came to the plate and hit a hard grounder down the line at third that Greg Dobbs, the ex-Mariner, made an excellent play on and tagged the bag at third to force Smoak while Kennedy scored. Carlos Peguero hit a ground ball off the end of the bat into the hole at short to load the bases again, this time for Franklin Gutierrez. Guti came through with a 2 RBI single, scoring Ackley and Olivo. Mariners 3, Marlins 1. The top of the ninth Miguel Olivo came through again as he hit a line drive homerun just inside the foul pole over the scoreboard in left field with Ackley aboard. Mariners 5, Marlins 1. Felix was on the on deck circle in the ninth as Gutierrez got on with another single but was pinch hit for Jack Cust. Cust struck out looking at three pitches to end the inning. The setting was all too familiar. 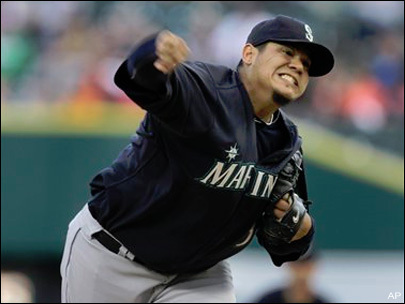 M's up 5 - 1 after a strong, stellar performance by King Felix and in comes Brandon League in a non save situation. Key the dramatic piano playing. League actually pitched quite well as he put down the Fish in order and sent the King's Court home happy. The offense came through today for the King. Not in the best fashion though as it took a long time to get started. Hopefully tomorrow will be another impressive outing from Jason Vargas and the offense can get something going for him too. And who said Ackley couldn't play second base?? ?